A Hawaiian blend with a delightful aroma, medium body and smooth yet rich finish. 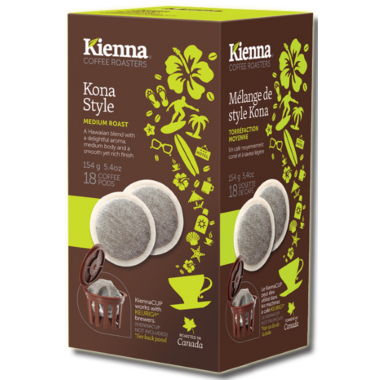 These pods provide an environmentally friendly alternative to non-recyclable k-cups as their pods are 100% biodegradable. Choose Kienna and... "Make Coffee NOT Waste". Includes one box of 18 coffee pods. For use with the KiennaCUP Adapter. This is a very smooth and delicious coffee. I tried it hot and really enjoyed it and tried it in an iced coffee and it was great. I will buy it again.